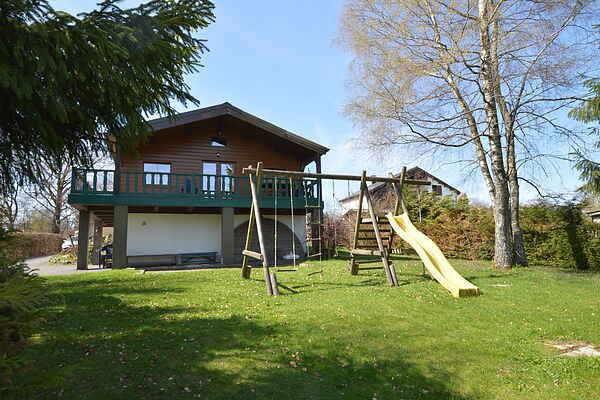 This cosy chalet with open fireplace and sauna is ideally situated in the heart of the Hoge Venen. There are lots of tourist activities and sights in the area. The chalet is tastefully decorated and the building style has a warm and cosy feeling. In the living room there is a large seating area with fireplace, a perfect place to gather with the whole family. The chalet has 3 bathrooms, one with a Jacuzzi and another with a luxurious shower cabin and sauna, the perfect place to relax. Outside there is a large covered patio, the ideal place for a lovely barbecue. The garden also has playground equipment, a boules court and a football pitch. The region has many cycling and hiking paths, starting right from the house. The nature reserve of the Hoge Venen is 2.5 kilometres away and the ski pistes of Ovifat are at 3 kilometres. Sourbrodt is 4 kilometres from the chalet and the lake of Robertville and the castle of Reinhardstein are 4.5 kilometres away. You can also visit Signal de Botrange, the village of Malmedy, the circuit of Francorchamps, the lake of Bütgenbach and the town of Spa. Our holiday houses are especially furnished to accommodate families.